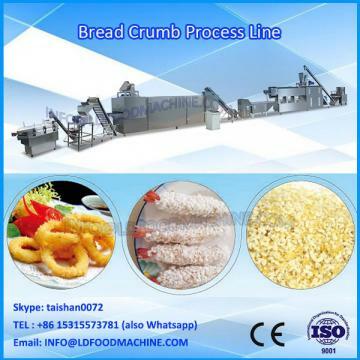 1.Bread crumbs is a widely used food additive for deep fried food, and mainly for frying food surface, such as: fried chicken, fish, seafood (shrimp), chicken, chicken wings, onion rings, etc. Its feature is crispy soft, tasty, delicious and nutritious. 2.Automatic Extrusion Breadcrumb Processing Line for bread crumbs production. It is from powder for wheat flour to bread crumbs automatically. No bread produced during the whole process. So no bread crust appeared. The final product is bright white and with good texture. 3. The output of our bread crumbs processing line is very reasonable: it can be (120-450kg/hr). 4. And the operation is very simple, the production time is within 20 minutes from raw material to final product.